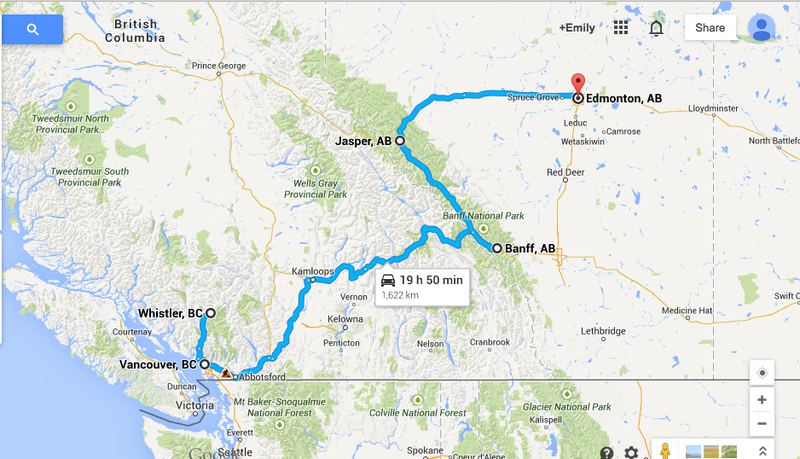 I know many of you have been wondering whatever happened on our driving tour of Western Canada two years ago. My last post involving our year stint as Canadians involved complaining about the cold and singing hallelujah to the Canada Goose Company. Which is about where I`m picking up- only two years and two moves later. But I`m sure you get as sick as I do of everyone whining about the cold and how unexpected snow is during the winter so I`ll skip the rest of winter and pick up where I last left off- our Canada Tour- from two summers ago. After a couple of years, it may be complete fiction with some pictures to inspire my story telling. Some of you may be asking, “What do you do in a car for 19 plus hours with two teenagers that doesn`t involve taking drugs?” For starters, drag the trip out for two weeks so the hours spent in the car with a student driver are limited otherwise the bills for Pepto Bismol and Tums make the cost of the trip prohibitive. Next you follow National Geographic`s recommendations religiously, eliminate all the boring stuff they use as filler and substitute a substantial amount of the hiking for fishing. Let`s face it, sitting by a picturesque lake with a beer is much less taxing than a climb requiring special shoes and heart defibrillator. This constitutes a Clampitt dream vacation. No duct tape required but helpful if one needs to attach the fishing rods to the top of the car because the bags of food required to keep Offspring #1 fed take up all the room in the back. We launched in Vancouver with a quick peek at the art scene. 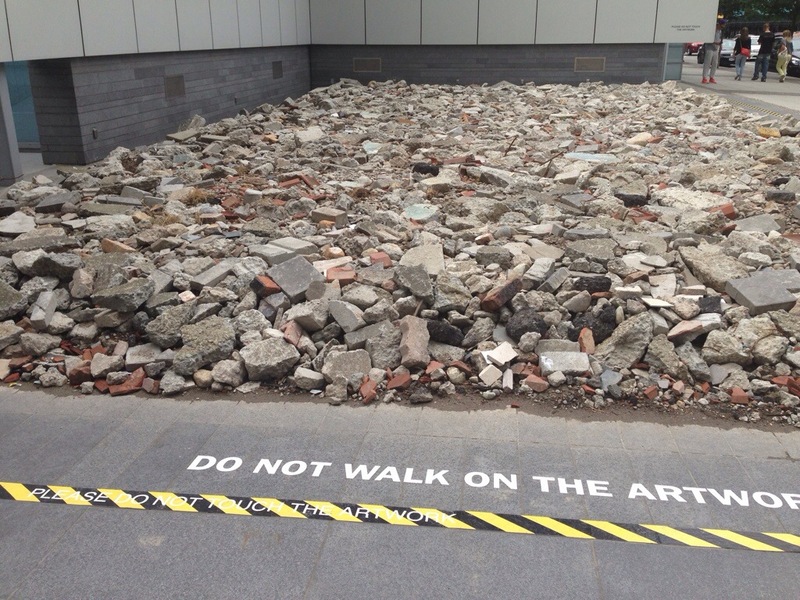 Apparently there isn`t a lively debate on what constitutes art in Vancouver. It’s surprising there weren’t several starry-eyed tourists and pot smokers excitedly debating the use of color in this collage, but somewhere in city hall there is debate on when the construction contracts will be renewed. Is this all we did in Vancouver? I think it is. We drank some coffee. OH- I wrote another post about Vancouver- I totally forgot. It`s here. We talked about visiting the University of British Columbia, which Spouse and I were all over given it costs about $10 to go to college in Canada. (Montreal students protested this astronomical tuition a few years ago but were unsuccessful in getting tuition lowered to $5 per year) Offspring #1 was convinced we had ruined his chances of getting in to college with our maniacal moving so we skipped it. We did stop for a visit with my Aunt, cousin and her husband. It`s hard to believe that I have blood connections to this talented branch of the family. (Have I ever mentioned my Dad is Canadian? Perhaps not) Auntie Numbers was the original Bachelorette. I got to visit the stylish 30 something vixen when I turned 13 without my annoyingly adorable younger sisters present to divert any attention directed towards me. I left wanting to live the life of the free unencumbered 70`s single lady- taking cabs to dinner and living in a posh 2 bedroom overlooking Vancouver. My poor cousin, an expert in childhood development and education, only hears from me when I need advice on something the Offspring need to do but won`t. She talks to me anyway God Bless her sweet heart. So Vancouver is great with lots of scenic stuff, expensive real estate and movie sets. But let`s talk about the real tourist attraction in the Great White North- fishing. This entry was posted in Canada, Culture and tagged Amblerangel, BC, Canada, Children, Culture, Emily Cannell, ExPat, Family, Hey From Japan- Notes on Moving, Humor, Moving, Offspring, parenting, Travel, Vacation, Vancouver. Bookmark the permalink. 2 Responses to So- Where Were We When I Last Told Riveting Stories of Canada? This is why I like the very traditional arts- realistic paintings etc because I KNOW I couldn’t do it- but I could dump some rocks on the ground and make it look the same!